In the old days, embarking on a creative project that required a bit of financial backing involved potentially awkward conversations with friends and family, or, if you were really desperate, a visit to the bank with a stocking over your head. And then along came the Internet and the crowd funding platform, with Kickstarter emerging as the main player among an ever-growing bunch of sites offering artists and others a way to get their projects off the ground and their dreams realized. The New York-based company, which has been in operation since 2009, has just published some stats for the last 12 months, and by the looks of it things are going well for the team and its enthusiastic community, with more than three million people pledging an impressive $480 million to Kickstarter projects. Break that down and you have daily pledge totals of $1.31 million, or $913 a minute. This is a decent increase on the 2.2 million backers who pledged $320 million in 2012, indicating people’s growing awareness of the site, not to mention the arrival consistently awesome project ideas cool enough to motivate Kickstarter visitors to dig into their pockets. According to the site’s stats, those who pledged cash in 2013 came from 214 countries and territories spanning all seven continents – that’s right, there was at least one backer in Antarctica who saw something they liked (possibly this?). As you might expect, community members appear to rather enjoy perusing the profusion of projects, with 807,733 backing more than one project, and 81,090 backing 10 or more projects. Almost a thousand people were enthusiastic enough to lend financial support to 100+ projects. 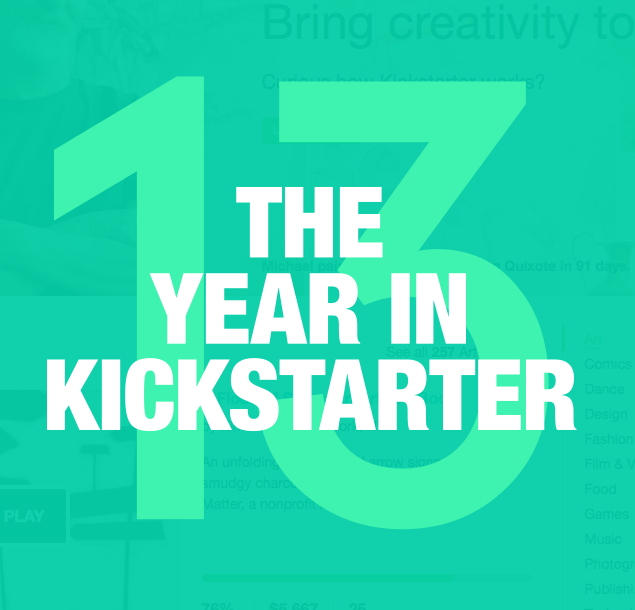 The stats reveal that 19,911 Kickstarter projects were successfully funded in 2013 (up from 18,109 in 2012), while “thousands more came to life” – presumably this means via additional funding methods. Highlighting some of the projects that made waves in the last 12 months, Kickstarter mentions the Pebble smartwatch, the Oculus Rift virtual reality headset, and the Ouya game console. Though funding can currently only be requested by creators in five countries – the US, UK, Canada, Australia, and New Zealand – anyone around the world can back a project, and with 2013 turning out to be a pretty active year for the Kickstarter community, we can surely look forward to more groundbreaking proposals via the site this year, too.